Not to mention, the majority of the free food-related themes we’ll feature are far from dinky. You’re going to find that they can carry the weight of your reservation process while also ensuring that your customers know what’s on the menu for the week or month. We recommend you test out all of the themes listed below, because after all, they’re all completely free. And we’ve done the work of filtering out the bad ones. Seeing as how these themes are free, you may have to sacrifice one or two of the standard features in a premium restaurant theme. However, the majority of them listed below still provide items like reservation tools and menu listings. If not, you can go out and find a third party plugin to do so. Some other features required of a restaurant include galleries for food and the interior, along with responsiveness and social media buttons. 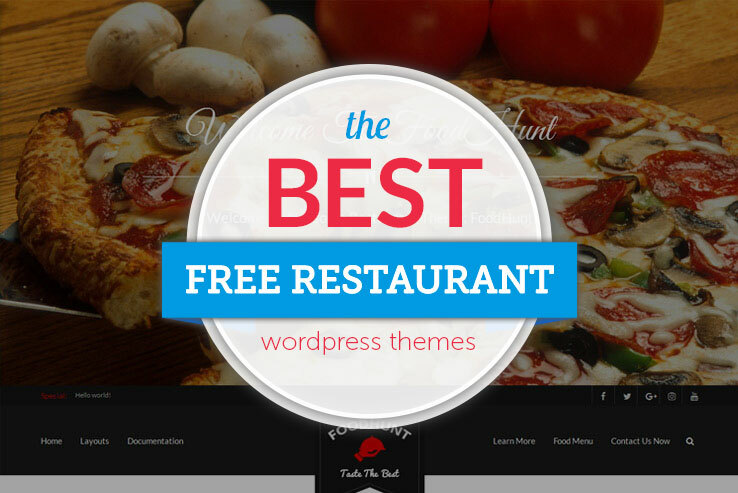 Which Restaurants Should Go For a Free Theme? A startup restaurant needs all the cost savings it can find. Therefore, it’s not uncommon for young restaurants to get the word out about their food and drinks with the help of a free theme. Some restaurants may realize that they may never need a premium theme, since lots of the free templates have everything they need. Quite often you’re better off spending money on premium reservation plugins, or more advanced hosting, as opposed to a premium theme. Given the fact that restaurants come in all shapes and sizes, free themes are for some restaurants and not for others. However, if a free theme catches your eye, share it with us in the comments and we’ll think about adding it to this article. 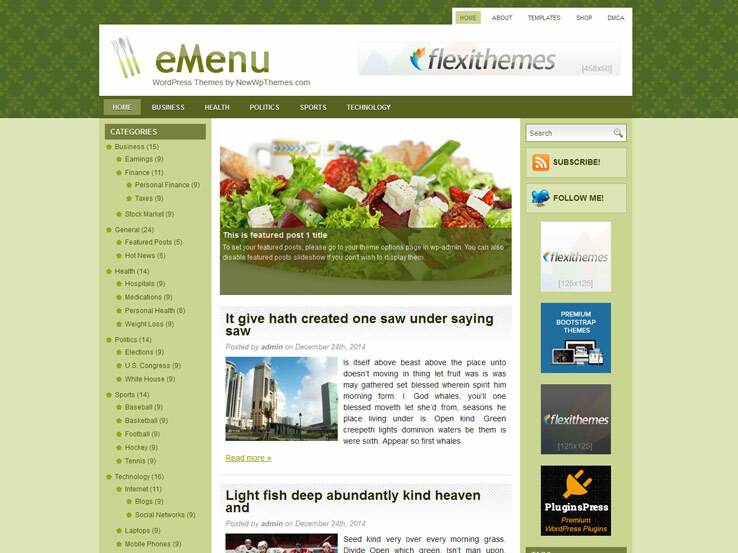 The eMenu WordPress theme starts off the list as a beautiful free theme for just about any niche in the restaurant world. The theme delivers a large category list in the sidebar, so you can organize your menu this way. You also might consider making a recipe website with that type of functionality. The localization tools are wonderful for connecting with all of the languages in your community, since your first language might not be what most people speak around your restaurant. The contacts page template connects you with customers who would like to ask you questions online. All you have to do is enter your email address and the contact form is completely ready. A featured posts slider comes along with the theme to show off your hottest dishes, while the WooCommerce compatibility lets you sell merchandise from your restaurant. Along with a responsive design for mobile orders, and search engine optimization built right in, the eMenu theme does quite a bit for such a lightweight template. 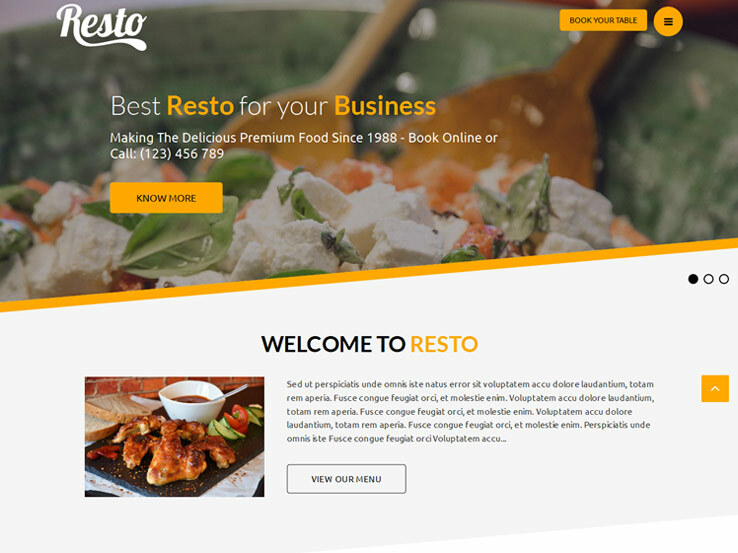 The Resto WordPress theme has a stylish and responsive design for all restaurants and food businesses. The Jetpack custom food menu allows for displaying your menu items in a reasonable fashion, and the stunning image support means that everyone who’s interested in your restaurant can see dishes before coming in. The theme is translation ready, and it comes with custom CSS options for those who would like to add some advanced customizations to the layout. The advanced color options link your color schemes to the logos, while the background image works nicely when you upload a picture of the restaurant or one of your dishes. The multiple menu and header options assist in welcoming people to your website, and the advanced slider ensures that you have an image presentation to show off your entrees, desserts, drinks, and more. Not to mention, you get items like “back to top” options and breadcrumbs to keep people on the right track. 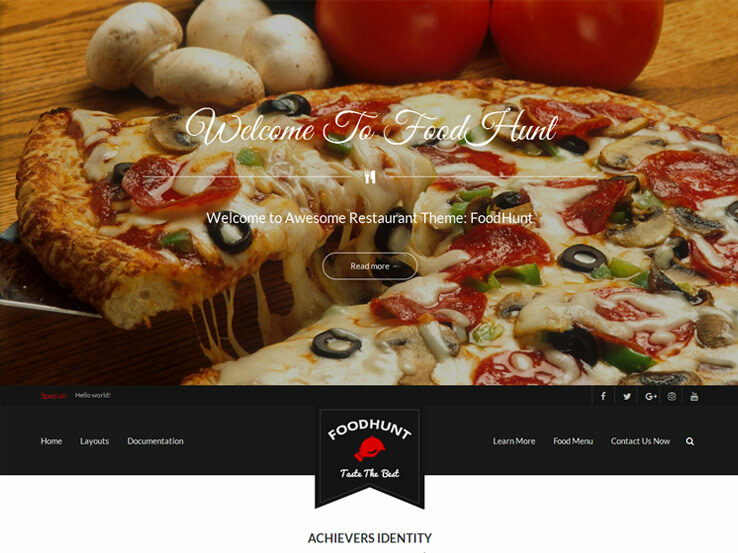 The FoodHunt WordPress theme looks more like a premium theme than any of the other solutions on this list. To start, it has a beautiful, modern design that’s suitable for cafes, restaurants, and other food businesses. You might even try it for a food truck. A premium version is provided, but we highly recommend the free version first, since it’s not that bad as a starting point. The theme is compatible with Restaurant Press, a plugin for compiling and organizing menus. The responsive design has a beautiful slider with interesting effects and transition controls, just in case your menu pictures need some more spice to them. The advanced typography elevates how your fonts look for call to actions, and the multiple color options make your branding a little easier to manage. The theme has an events calendar for that next cookout, along with WooCommerce support and a special recipe showcase module. Along with parallax effects, a fun facts section, and translation tools, the FoodHunt theme aims to please. 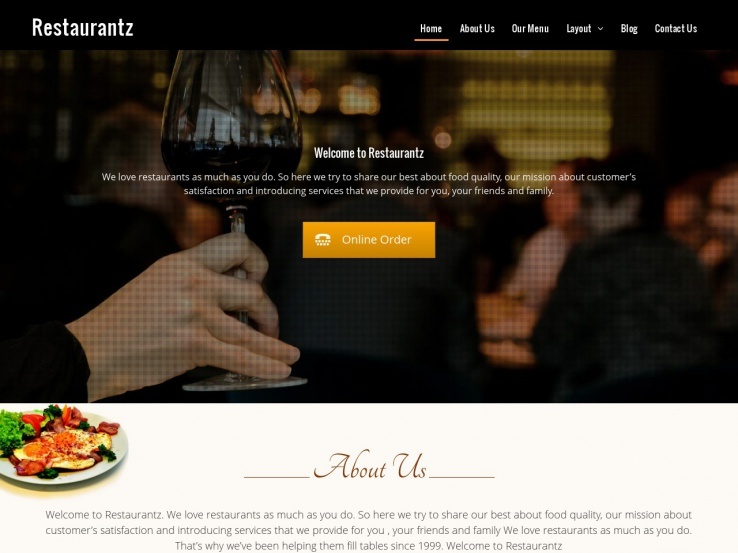 If you take the Restaurantz theme you’re bound to establish an elegant and professional looking restaurant website. The theme has a responsive design, along with a beautiful slider for showing off food images and buttons to your menu. Online ordering is possible with the help of a plugin, and the Page Builder plugin uses a drag and drop interface for getting your site launched in a reasonable amount of time. The Restaurantz theme features a custom background, and you get everything from custom colors to custom logos. The menu can be constructed to lead folks to menus and events calendars. You can even have a full width page if you’d rather clear out all the clutter from sidebars. Translation settings come along with the Restaurantz theme, and you receive threaded comments for getting in conversations with your customers after your blog posts. 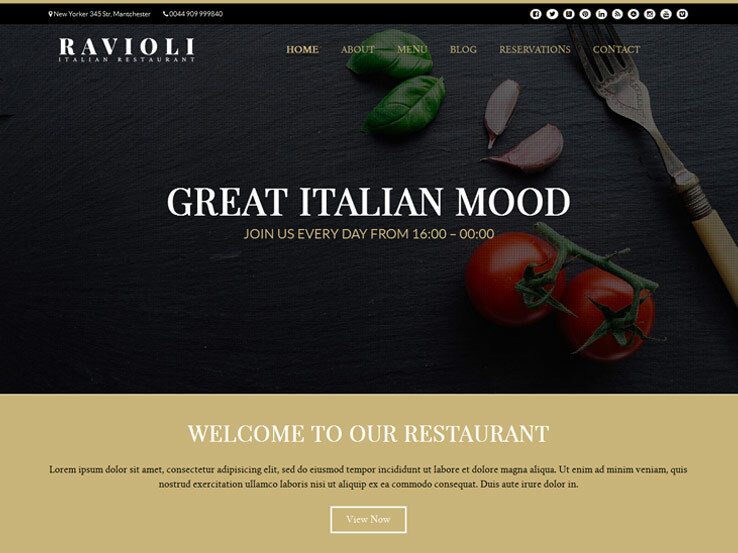 The Italian Restaurant theme doesn’t necessarily have to be used for an Italian business, but it certainly has an upscale design with support for lots of images and beautiful menu options. The modern and stylish theme is completely responsive for people to view all of your menus on smaller devices. A powerful reservation system comes bundled in with the theme as well, allowing for customers to book tables at your restaurant. The theme includes items like custom menus for linking to your blog, menu, and reservation system. You get shortcodes for items like buttons and columns, along with full width pages for any landing pages that may need more room. The custom colors are easy to change around, and the custom background can be utilized for sharing a large image of Italy, or wherever you food comes from. The Italian Restaurant theme also provides settings for threaded comments, columns, translations, and sticky posts. We would recommend using the Greek Restaurant theme for an actual Greek establishment. Any cuisine could be sold through the free theme, but the default colors and designs look so darn Greek-like. The theme includes a logo in the middle of the header area, and you can upload images for the large slider. This is a responsive bootstrap theme, and the lightweight design lets you accept reservations and even move up in the search engines because of the built-in SEO. The custom background can be adjusted to whatever you want, but the default color starts as blue. The featured images on the homepage can be used for showing items from your menu, and the multiple columns are nice for organizing the multiple dishes on your menu. The translation tools may eventually come in handy, while the sidebars are great for inserting widgets for social media, food image galleries, and more. We also like that the theme has threaded comments. Now here’s a theme that’s made for those Chinese Restaurants out there. It has a unique set of fonts and designs, which we like for all Asian restaurants. It’s another Twitter Bootstrap theme, and you get the responsive elements that snap into place on phones and tablets. I can see sushi bars loving the theme, since you can share recipes, menus, and beautiful photos of the cuisine. Not to mention, you can adjust the languages for those who may not speak your native language. The free restaurant reservation system turns this theme into more of a premium solution. After all, one of the main items you would generally pay for is a booking system. 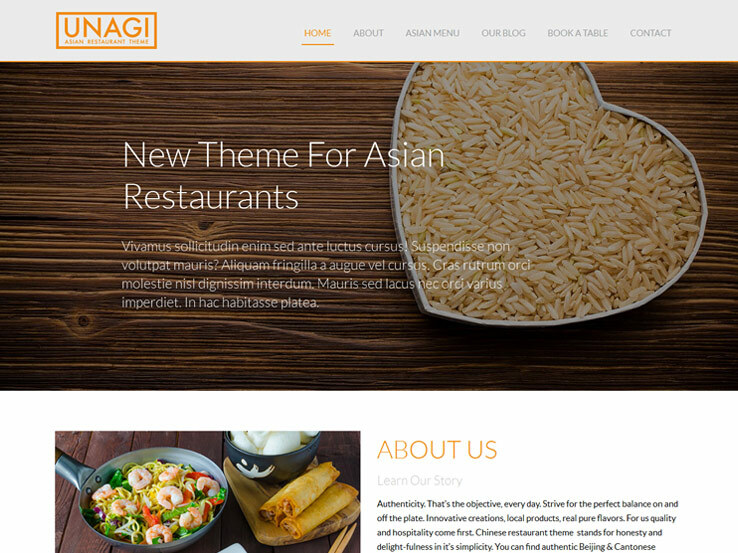 Along with that, the Chinese Restaurant theme provides custom headers and backgrounds, both of which combine well with the colors and menus, making this a branding dream. You can also insert multiple sidebars if needed. Finally, the Chinese Restaurant theme contains other useful features like threaded comments, flexible headers, and sticky posts. 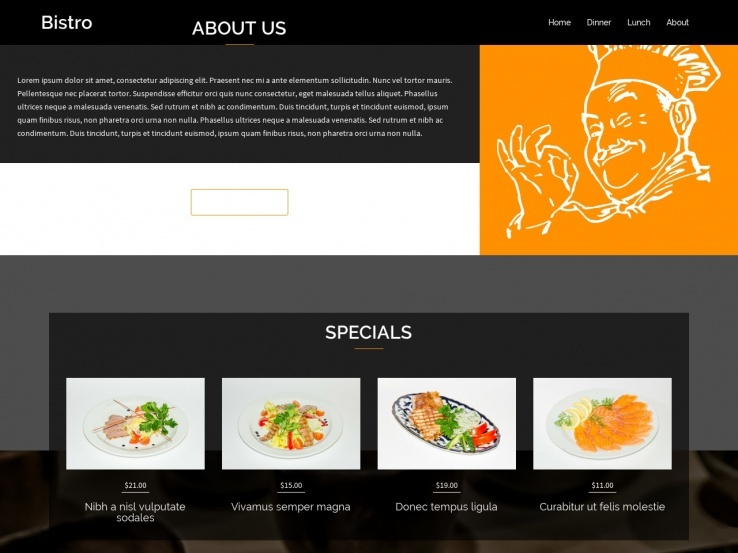 Want a neat and elegant website for your restaurant or food-related business? If yes, give the Canape theme a try. This free WordPress template provides a bold and classic look along with useful features such as a menu template for highlighting your menus and integration with an online reservations module so people can easily make bookings through your website. The Canape theme is photo-friendly, which makes it easy to show off photos of your interior and foods. In fact, the front page features a large full-width banner that’s great for welcoming site visitors and drawing them further into the site. You’ll also find custom colors for branding, responsiove layouts, and widgets to easily add things like recent posts or category lists to your sidebar. 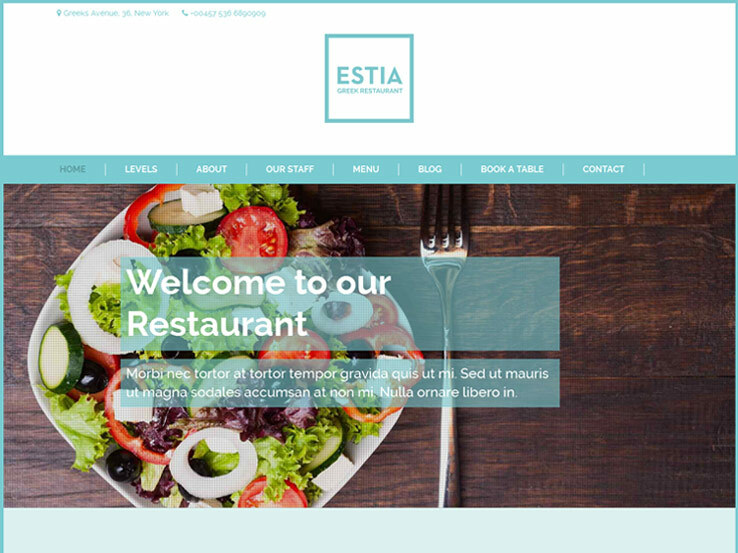 The Bistro theme is a great choice for building your restaurant website. It comes with a restaurant plugin to help build your menus without problems, Google Maps support so people can easily find your restaurant’s location, and a testimonials module to display customer feedback. Welcome your site visitors with an attractive full screen image slider, complete with welcoming text and call-to-action buttons to drive in visitors. We also love this template’s use of parallel scrolling effects that deliver a modern immersive browsing experience and are sure to impress your site visitors. 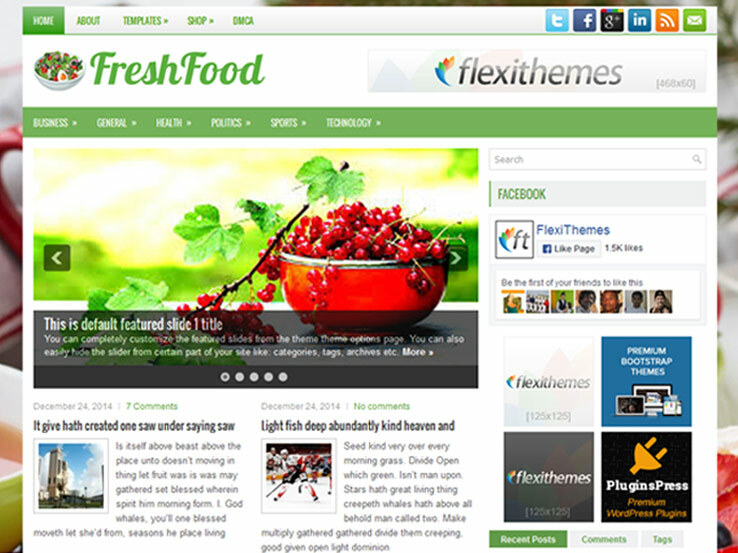 Designed and developed by the folks at FlexiThemes, FreshFood is a cool WordPress theme you can use to build your restaurant’s website. It comes with a customizable featured slider to highlight photos of your restaurant or foods, eCommerce support so you can easily sell your merchandise online, and social media integration so people can easily follow you and help promote your restaurant on Facebook, Twitter, Instagram, and other social networks. Your website will look great on mobile devices and rank well in search engines since this template is responsive and optimized for SEO. Also, you’ll be able to reach your customers in different languages because the FreshFood theme is easy to translate. In addition, you’ll find a well-organized theme options panel to easily customize your site, custom widgets to easily display additional features, and several page templates to easily create sitemaps, contact forms, and more. 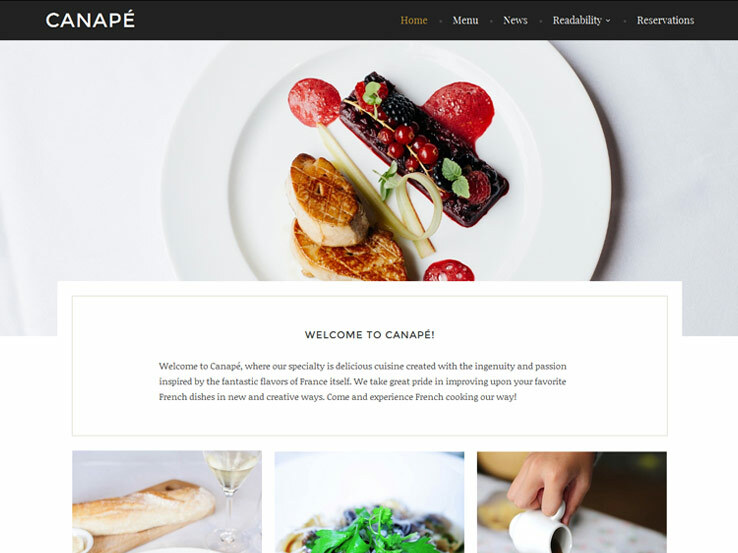 Cafe is a beautiful responsive WordPress theme with a mobile-friendly design and an attractive background image that you can replace with a photo of your own restaurant. The template comes with many useful features, including WooCommerce support so you can easily setup an online shop for your restaurant, a featured posts slider for displaying images of your restaurant with links to drive visitors further into your site, as well as social media integration. The template is designed to be easy to use as it includes a user-friendly theme options panel for controlling your site’s appearance as well as custom widgets for adding things like adverts, social links, and other content to your sidebar. The theme’s clean code adheres to WordPress best practices and it’s SEO-optimized so you won’t have problems ranking in search engines. 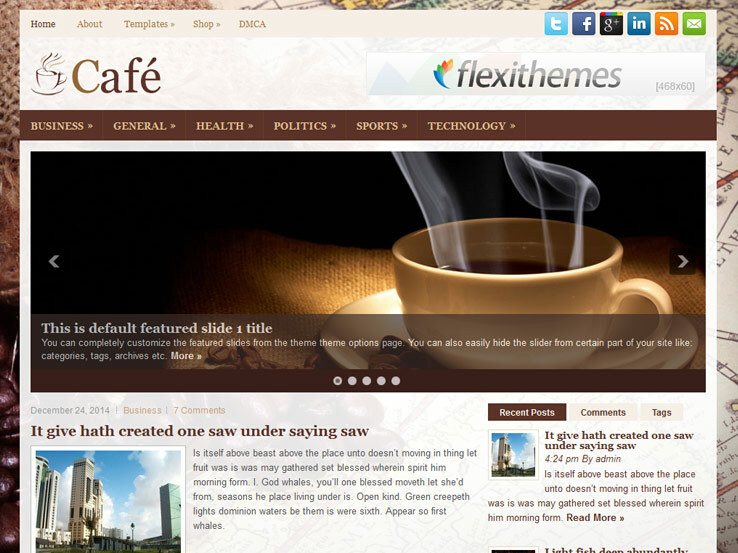 Cafe’s other notable features include page templates and multilingual support.